Article should at least consit of these parts: Introduction, Literature Review and Hypothesis Development ( only literature review for qualitative research), Research Method, Result and Analysis, Conclusion and Reference. Acknowledgement (if any) should be palced after the Conclusion and before the Reference. Article should be written efficiently in approximately 10 to 20 pages. Authors are encouraged to use Mendeley applications for citation and referencing. Manuscript must follow SAR's template of manuscript. Template for authors can be downloaded here. Title. Tiltle in Indonesian should consist of no more than 12 words, while title in English should consit of no more than 10 words. Name of Authors, Institution and Email. Name of authors without academic degree. Coresponding author must stated his/her email. Abstrack and Keywords. 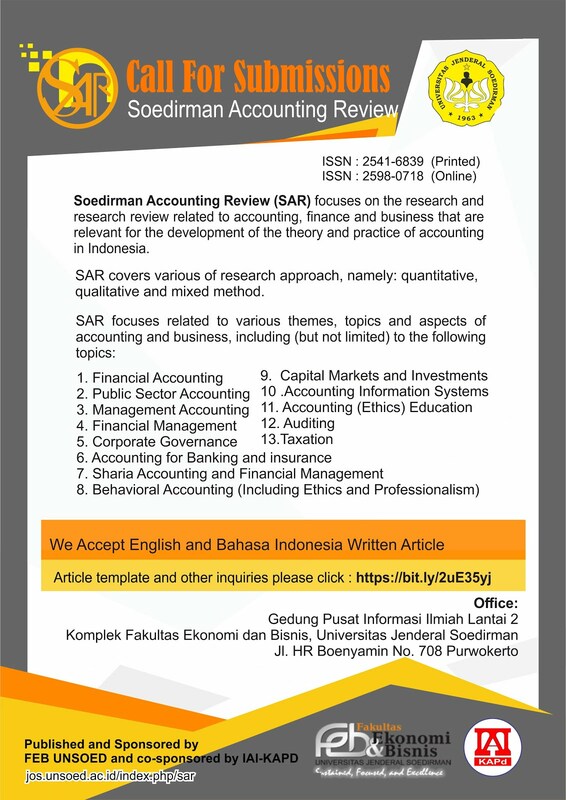 Abstract are written preferably from 100 to 250 words and needs to be written in both English and Indonesian. Abstract should provide summary of purpose of the article, method, result and conclusion. Abstract should also be followed by keywords of 3 to 5 words. Introduction. Provides explanation of research background, purpose of the research and research contribution. Literature Review and Hypothesis Development, contains previous literatures related to the research and explains the hypothesis development. Research Method,describes research plan or research design, research object and target (population and sample), technique in collecting research data, research model and rechnique used for analysis. Result and Analysis. Present result of data analysis, hypothesis testing, answer of research question, as well as finding and its interpretation. Conclusion. Describes the research conclusion, limitation of the research, and suggestions for conducting future research. One source of citation with one author: (Syafruddin 2001); two authors: (Habbe and Hartono 2000); more than two authors: (Budiono et al. 1999); more than one source of citation with different authors: (Mardiyah 2001; Kusumawati 1999); more than one source of citation with similar author: (Djakman 1998, 2000). When citation is accompanied with page number: (Brownell 1981, 845). When referring to author with more than one article in the same year, use letter a, b, … after year on citation, e.g. (Joni 1999a, 1999b) or (Joni 1999a, Daud 2000b). Source of citation from an institution’s work should mention the acronym of the institution, e.g. (IAI 1994). Not less than 80% of the total cited literatures should be in the form of papers published in national and international scientific journals. The suggested references are the most recent publications (within the last 8 years). Articles in preparation, unpublished observations, and personal communication should not be included in the reference list but should only be mentioned in the article text. The other references can come from textbooks, proceedings, or other valid scientific sources. Information sources that come from online sites (internet) are allowed if the sources are trustful and accountable, such as research institution site, universities, and governments. Cooper, D. R. and P. S. Schindler. 2001. Business Research Method. New York: McGraw Hill. Fitriany and D. Sari. 2008. Studi atas Pelaksanaan PBL dan Hubungannya dengan Prestasi Mahasiswa. Paper presented at the Simposium Nasional Akuntansi XI, Pontianak. We HIGHLY recommend that authors use reference managers such as End Note, Mendley.